With President Trump skeptical of the WTO’s usefulness and Doha negotiations stalled, the future of global trade rules is in doubt. The World Trade Organization (WTO) is the principal forum for setting the rules of international trade. In its two decades, it has helped reduce barriers to trade in both goods and services and created a dispute resolution system that supporters say has reduced the threat of trade wars. However, the institution is under considerable pressure. 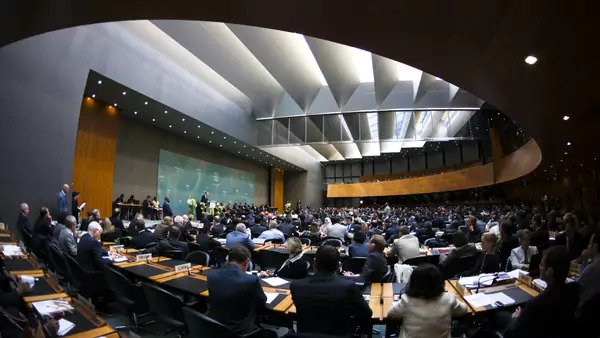 Negotiations on a comprehensive development agenda have foundered on disagreements over agricultural subsidies and intellectual property rights, while members have increasingly turned to separate bilateral and regional free trade agreements to advance their trade interests. Meanwhile, U.S. President Donald J. Trump has criticized the WTO for what he sees as its weakness in confronting China’s trade abuses and constraints on U.S. sovereignty, placing the future of global trade rules into doubt. The WTO is responsible for overseeing the rules of international trade. It facilitates trade negotiations among its members, which have increased from 123 in 1994 to 164 in 2018. The organization also monitors the implementation of those trade agreements, produces research on global trade and economic policy, and serves as a forum for settling trade disputes between nations. Established in 1995 and based in Geneva, Switzerland, the WTO is the successor to the General Agreement on Tariffs and Trade (GATT), an organization founded in 1948 whose rules created the modern multilateral trading system. WTO decision-making happens at the Ministerial Conference, generally held every two years. There have been eleven such ministerials since the inaugural conference in Singapore in 1996. With a few exceptions, agreements reached at these conferences are made by consensus, meaning that all members must agree, and decisions are binding. WTO rules are enforced by individual member nations, which can impose retaliatory trade sanctions on states that break them. While the specifics of the WTO’s trade rules are hashed out in negotiations, the organization is based on several founding principles. The most basic is a commitment to openness, meaning reducing tariffs as well as limiting quotas, import bans, distorting subsidies, and other barriers to trade. Another central plank is nondiscrimination, in which WTO members must treat trade from all other members equally. The WTO also seeks transparency and predictability in trade-related regulations and promotes international standards to give citizens, companies, and investors stability. And the WTO is also committed, in principle, to giving less-developed countries greater flexibility and accommodations to help them adjust to new rules. How does the WTO deal with conflicts? 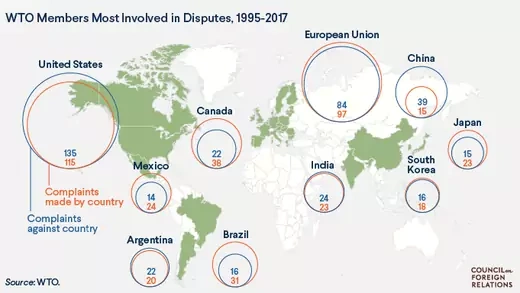 The WTO’s trade dispute mechanism has been used extensively over the past two decades, helping to avoid unilateral responses to disputes and potential trade wars. Since 1995, members have filed more than five hundred disputes with the WTO. Most of these are settled in consultations or by agreement before advancing to litigation. Upon joining, all members agree to a dispute settlement mechanism, in which WTO-appointed trade experts can render binding judgments. When one member files a complaint against another, the countries must first attempt to resolve the issue through consultation, and only if that fails is a panel chosen by the WTO’s Dispute Settlement Body to hear the case. A panel’s recommendations, if not overturned on appeal, must be implemented by the offending country. If the country fails to respond, the plaintiff can then take targeted retaliatory measures, such as blocking imports or raising tariffs. The United States is the most active participant in the system, having filed 116 complaints and served as defendant in 136 cases. China has become a particular target for U.S. policymakers, who have increasingly used the WTO process to challenge Chinese government support for domestic industries, restrictions on imports, abuse of intellectual property, and other state-led trade policies. Between 2009 and 2017, the Obama administration brought twenty-five cases to the WTO, more than any other country in that period, and sixteen of those targeted China. The administration won seven of its WTO cases against China, including limits on Chinese agriculture and aircraft subsidies and steel import duties; the others are ongoing. While Trump has denounced China’s trade practices, his administration’s 2018 report on trade with China [PDF] maintains that the WTO is incapable of dealing with the problem. Instead, Trump has sidestepped the WTO system. He has applied tariffs targeting overproduction of steel and aluminum by China and others based on a little-used national security law, as well as announced further measures to retaliate against China’s investment restrictions. CFR’s Edward Alden has called Trump’s willingness to bypass the WTO the death of the institution. The appeals system is also under pressure. The Obama administration drew criticism from many members for a May 2016 decision to block the reappointment of a South Korean judge to the WTO’s Appellate Body, the first time any country blocked the appointment of a judge from another country. Trump has continued to block new appointments, leaving three judgeships out of seven vacant and hobbling much of the court’s work. What is the Doha Development Agenda? At the ministerial conference in Doha, Qatar, in 2001, WTO members agreed to a new round of negotiations that promised to put developing countries at the center. This became known as the Doha Development Agenda, or the Doha Round. Liberalizing global agricultural trade was the linchpin of the agenda. Many of the world’s poorest nations depend on exporting basic agricultural products but struggle to compete against richer nations that support their farmers with subsidies. The Organization for Economic Cooperation and Development (OECD) estimates that these subsidies total nearly $300 billion annually. Analysts say that agricultural lobbies in the United States, Europe, and Japan have consistently exercised their considerable political clout to convince lawmakers to maintain such subsidies. Liberalizing global agricultural trade was the linchpin of the Doha development agenda. Developing countries argue that without a reduction in developed countries’ subsidies, they must maintain tariffs and maintain their own domestic subsidies. A major sticking point has been the terms of a proposed “special safeguard mechanism,” which would allow developing countries to temporarily raise tariffs to protect their farmers from sudden price drops or import surges. The Doha agenda also sought to further reduce barriers to trade in services, such as business and financial services, and nonagricultural goods. The Doha talks operated on the principle of “special and differential treatment,” promising to give developing countries more time to implement changes and the financial and technical support to help them do so. However, by 2008 negotiations had collapsed due to disagreement on agriculture subsidies and the special safeguard mechanism. What is the status of the Doha Round? Negotiations continued after the 2008 global financial crisis with low expectations. But the 2013 ministerial in Bali, Indonesia, delivered a significant achievement, the first multilateral agreement since the creation of the WTO. This was the Trade Facilitation Agreement (TFA), which aims to speed up customs procedures and make trade easier, faster, and cheaper. The WTO estimates [PDF] that this could increase global trade by some $1 trillion. The talks also reached an interim agreement on “public stockholding,” continuing exceptions that allow developing countries to stockpile agricultural products to protect against food shortages. The TFA was only a small slice of the larger Doha agenda, but the successful deal was a cause for optimism: Director-General Ricardo Azevedo proclaimed that the WTO was “back in business.” In Nairobi in 2015, members made progress on a number of issues, including the phasing out of agriculture export subsidies and an agreement among some members to cut tariffs on information technology (IT) products. What are the criticisms of the WTO? Intellectual property. The WTO’s intellectual property agreement, Trade-Related Aspects of Intellectual Property Rights (TRIPS), draws criticism from experts who have argued that WTO rules on drug patents have limited access to medicines in poorer countries. The WTO says that enforcing patent protections is central to expanding global trade. Sovereignty and regulation. Other critics say WTO rules overrule national sovereignty, and in doing so erode environmental and labor protections. Environmental groups have criticized WTO decisions on genetically modified foods, as well as recent WTO rulings against what it considers discriminatory environmental labeling, as in the case of U.S. dolphin-safe labeling. Labor unions in the United States argue that the WTO is inadequate for protecting U.S. wages from being undercut by unfair labor practices abroad, alleging, for instance, that China violates basic workers’ rights to lower the cost of its exports. Developing countries counter that attempts to address labor standards at the WTO are a form of protectionism in disguise. Trump has been a vociferous critic of Chinese state-led development policy. Import competition. Some economists allege that by promoting imports and encouraging firms to move their operations abroad, WTO-led tariff reductions hurt U.S. jobs and wages. The Economic Policy Institute’s Robert E. Scott and Will Kimball estimate that China’s entrance into the WTO in 2001 led to the loss of more than three million U.S. jobs, as U.S. firms were forced to compete with China’s much cheaper imports. Some estimates find [PDF] a smaller, but still substantial, loss of around two million jobs, while other experts contend that technological changes, not China, were responsible for those losses. Trade proponents including Dartmouth College economist Douglas Irwin say that increased trade with China benefited the U.S. economy by lowering prices, increasing productivity, and expanding exports. Response to China. Trump has been a vociferous critic of Chinese state-led development policy, arguing that while the United States has adhered to global trade rules, other countries—primarily China—have gained an advantage by ignoring them. CFR’s Alden says that Washington and its allies “did too little for too long,” failing to confront China’s abuses at the WTO. What are the alternatives to the WTO system? Even with Doha stalled, WTO talks have continued on what are known as plurilateral negotiations, or agreements among subsets of WTO members. Plurilateral deals are easier to negotiate, as they focus on narrower issues and not all members are bound by their terms. At the 2015 Nairobi talks, for instance, fifty-three WTO members concluded an expansion of the Information Technology Agreement, or ITA, which reduces trade tariffs on a raft of IT products. The agreement means that more than 97 percent of all global IT trade is now covered by WTO rules. A major potential plurilateral in progress is the Trade in Services Agreement (TISA), under negotiation since 2013 [PDF] among twenty-three members, including the EU but not China. Backers of TISA hope to use the talks to further the WTO’s liberalization of the global services trade, the rules for which haven’t been updated since 1995. In 2012, nineteen members agreed to update the Government Procurement Agreement (GPA), which seeks to further open government procurement markets. And in 2014, fourteen members, including the United States, China, the EU, and Japan, opened negotiations on a proposed Environmental Goods Agreement (EGA), which would liberalize trade in environmental products, such as wind turbines and solar technology. Many countries have also turned to bilateral free trade agreements (FTAs) or larger regional ones. The Obama administration pushed for so-called mega-regional deals, such as the Trans-Pacific Partnership (TPP) and the U.S.-EU Transatlantic Trade and Investment Partnership (TTIP). But Trump is deeply skeptical of multilateralism, preferring to deal with trading partners on a bilateral basis. He withdrew from the TPP immediately upon taking office, and the remaining members completed the deal without the United States. Even as U.S. allies advanced FTAs without him, Trump began pursuing unilateral measures to confront China and other countries on trade, raising serious doubts about the future of the WTO. The WTO process could help improve global regulatory cooperation, writes CFR Senior Fellow Thomas J. Bollyky in this paper. The WTO’s decision-making process requires significant reforms to serve the interests of the poorest nations, writes economist Amrita Narlikar in Foreign Affairs. In this essay in Foreign Affairs, trade expert Douglas Irwin argues that the benefits of global trade are consistently misunderstood. This 2014 Congressional Research Service investigation explores the implications of the WTO’s Doha round for U.S. agriculture. A U.S. withdrawal from the WTO would upend decades of rule-based diplomacy, write Pedro Nicolaci da Costa and Cathleen Cimino-Isaacs in this Peterson Institute of International Economics analysis. China’s industrial policy is aimed at rapidly expanding its high-tech sectors and developing its advanced manufacturing base, but President Trump and other leaders of industrial democracies see the plan as a threat. With President Trump taking aim at existing trade agreements, countries are increasingly grappling with dispute resolution mechanisms and their implications for global trading rules.